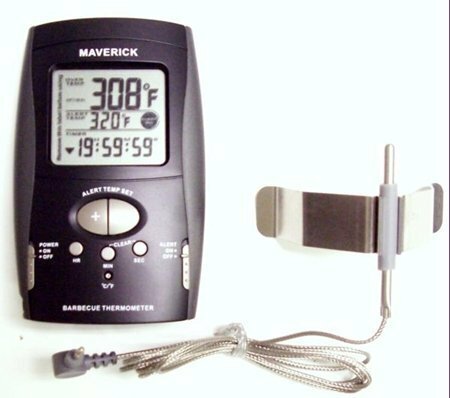 The digital grill or smoker chamber thermometer by Maverick OT-3BBQ has an easy to read digital display that sits outside of the cooking chamber. This thermometer features an alert if the temperature gets to hot or cold, and a count up or down timer. 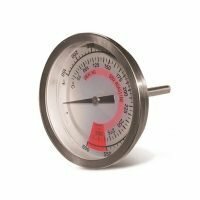 This is great for those who do not think that the hood thermometer on their grill is accurate or those who need a second opinion on the temperature. 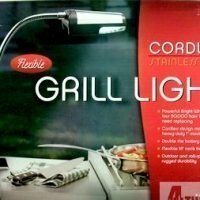 It can easily be moved from grill to smoker and even to your oven if needed. 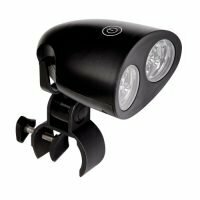 The display has a metal stand as well as a magnetic back for easy mounting anywhere around your grill. You can program your ideal temperature and the unit will warn you when there is a 15 degree variation from that temperature either high or low. You can also set a timer for timed cooks as well. The single temperature probe comes with its own little metal stand that clips between your grates and hold the probe just slightly above the surface. Replacement probes are also available directly from the manufacturer here. The probe wire is rated heat-resistant for up to 700 degrees. 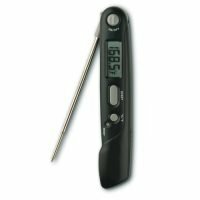 Which is a big deal because this is what fails on most digital thermometers. When a probe wire is exposed to direct heat and flame from your grill for long periods of time, it is bound to fail.